Brussels, the conference on "rising the state-sponsored terrorism by Iran regime"
The Belgian capital, Brussels, is hosting a conference partaking former diplomats and European experts on the issue of rising the state-sponsored terrorism by Iran regime, and the threats it poses to Europe and the United States. Mousa Afshar, an official of the Iranian opposition in Paris, said that the conference was very important and was holding at a very critical time. Speakers at the conference, included Mr. Louis Freeh, the former Director of the Federal Bureau of Investigation (FBI) from the US, Mr. Giulio Terzi, the former Italy’s Minister of Foreign Affairs, Claude Monique, co-founder and executive director of the European Center for Strategy and Strategic Security, and Mr. Alejo Vidal-Quadras, the former deputy speaker of the European Parliament, from Spain. 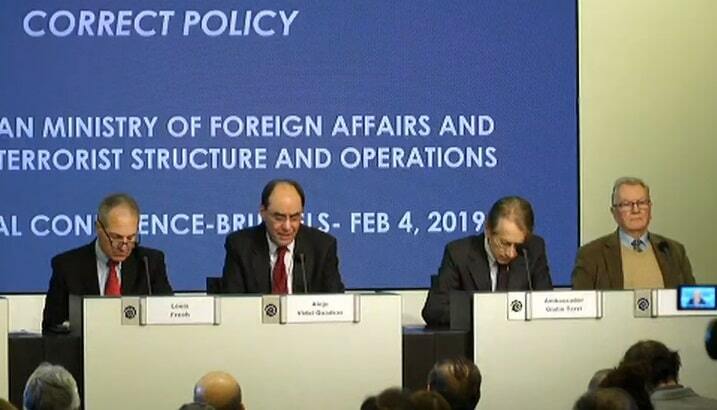 According to the organizers, the conference was held at a dire time of rising the state-sponsored terrorism by Iran regime in Europe and the US in 2018, with at least four failed attempts in France, Albania, Denmark and the United States of America. The European Union blacklisted an institute of the Iranian Ministry of Intelligence (MOIS) and two senior officials, on January 8, 2019. Following the nuclear agreement in 2015, this was the first sanction carried out by EU against rising the state-sponsored terrorism by Iran regime, which reflected the significance of the case for the European states. Indeed, it was a turning point of the European diplomacy regarding Tehran’s malign activities in planning and carrying out terrorism. The conference discussed the recent the roles of the Iran regime’s relevant organizations, the Qods force, and MOIS, in stepping up terrorism, their objectives and targets, their threats posed to western citizens, and the proper stance which must be taken by the international community regards the state-sponsored terrorism by Iran regime. Dr. Alejo Vidal-Quadras opened the conference by giving a brief on rising the state-sponsored terrorism by Iran regime in Europe and America and criticizing European External Action policy and a lack of a firm policy regarding the Iranian regime. Dr. Quadras pointed to the fact that some of the Iranian regime’s diplomats accused of terrorism had close ties to Hassan Rouhani and accompanied Javad Zarif in his meetings. 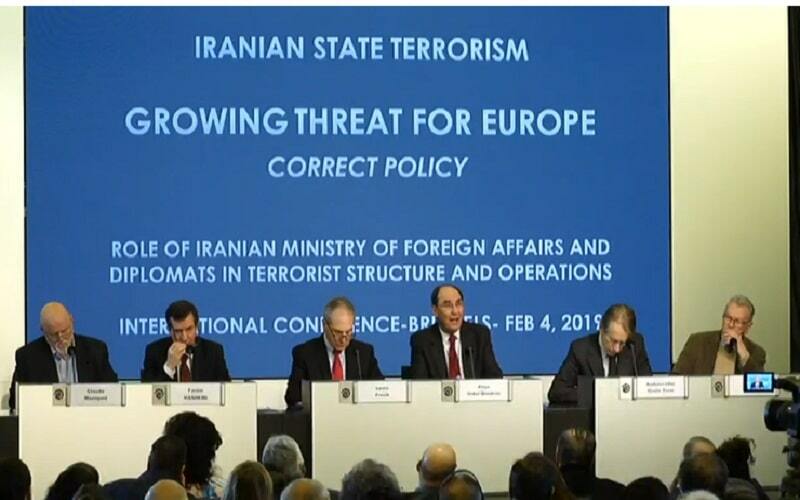 Mr. Quadras expressed his surprised over the EU states’ stances and asked about the reasons that they did not sanction the entire Intelligence Ministry and did not blacklist the MOIS and the IRGC. Mr. Quadras in part of his speech raised the question of Why not sanctioning the regime’s supreme leader who endorsed all of the terrorist operations. And added that the EU could not have normal relations with a regime which jeopardizes the safety of citizens in Europe and the U.S. The next speaker of the conference was Mr. Louis Freeh, the former director of the FBI. He stipulated that the terrorist activities of the Iranian regime were not the work of only several rogues performing unilateral acts on their own, but it was clearly state-financed and state-controlled. Pointing to the several-year-old JCPOA, Mr. Freeh said that the Iranian regime could not be trusted and there could not be a meaningful relationship possible. It could never be trusted. The mullahs do not have the same respect for the rule of law as others do. Mr. Freeh stated that terrorism was not a pattern of behavior but it was institutionalized. Appeasement of the Iran regime, not only conveyed a sense of weakness, but it conveyed to the adversary to continue to do what it did. the next speaker was Mr. Farzin Hashemi, Deputy of the NCRI. He said, “I would like to focus on rising the state-sponsored terrorism by Iran regime which is carried out by the Ministry of Intelligence (MOIS) and the IRGC in collaboration with the Foreign Minister. Farzin Hashemi added that the commander of the Paris bombing, Assadollah Assadi, was the highest intelligence officer of Iran regime in Europe. He was supervising all the activities of the MOIS in Europe. Farzin Hashemi pointed to the ironic fact that Mohammad Jafar Sahraroodi, who personally assassinated Abol-Rahman Qassemlou, the leader of the Kurdish Democratic Party of Iran in Austria, now is the head of the Majlis Speaker, Ali Larijani, bureau and the chief of protocol, who welcomes heads of state to Iran. Then, Mr. Giulio Terzi took the floor. 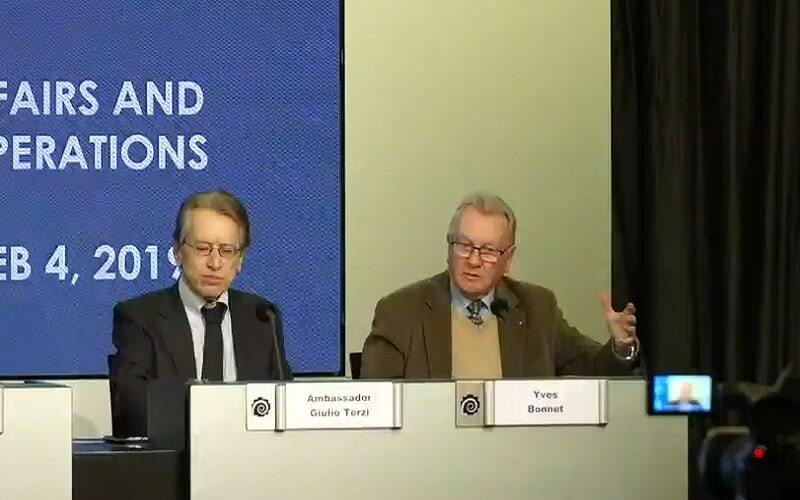 Reminding the Iranian regime’s cyber threat, as an element of subversion and another issue of concern, Mr. Terzi pointed to the strong existing evidence that obliged Twitter and Facebook to admit that Iran is using social media against the west. Mr. Terzi stated, “There is much more to do about the expulsion of Iranian diplomats from Europe and their embassies closed down for the safety and security of our people,” and “Special attention is needed for counteracting the cyber threat from Iran. There are different format and forms, but the specific cyber threat coming from Iran must be dealt with in specific ways,” he added. Mr. Claude Moniquet, the Co-founder and CEO of the European Strategic and Security Center was the next speaker who pointed to the fact that the Iranian regime’s terrorism has been going on for 40 years and the terrorism fuels their foreign policy. Mr. Moniquet stipulated that the Supreme Security Council in Iran was chaired by Hassan Rouhani and the authorities of all branches were concentrated in that council that made the decisions which were endorsed by the Supreme Leader. Claude Moniquet recalled other means that Iran’s Ministry of Intelligence uses to fulfill its missions by taking advantages of non-official agents, for example, Melli Bank branches in EU, or by cooperating with the Qods Force that has 25.000 members and gives support to the Syrian Government and the Hezbollah of Lebanon.